Our classically restored Ramada is a Downtown Landmark Hotel and Conference/Convention Center in the heart of the Capital Plaza area of Downtown Topeka, Kansas. 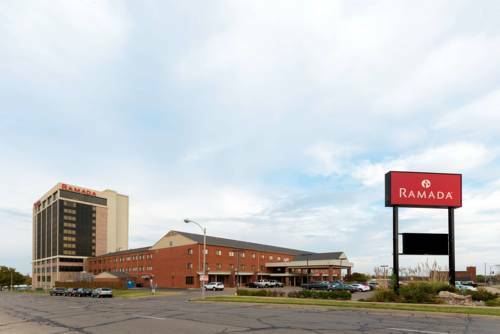 The Ramada Topeka Downtown Hotel and Convention Center is conveniently located on Interstate 70 at exit 361B close to all the local area attractions and activities including the Kansas Expocentre, Agricultural Hall, Heritage Hall, Landon Arena and the R.R. Domer Livestock Arena. Ramada Topeka Downtown Hotel and Convention Center is just minutes from the Kansas State Capital Building, Kansas State House, the Topeka Performing Arts Center, the Topeka Civic Theatre, the Kansas Museum of History, Washburn University, Hummer Sports Park and the Topeka ExpoCentre. While enjoying your stay in Topeka be sure to visit the Topeka Zoo, the Combat Air Museum, Great Overland Station and Heartland Park Racetrack all just a short drive from the Ramada. Among the many features we offer every guest of the Ramada Topeka Downtown Hotel and Convention Center is a Smoke Free Hotel, we also have Complimentary Wireless High Speed Internet in all rooms and public areas, Complimentary Hot Breakfast for every hotel guests, Heated Indoor Pool, Seasonal heated Outdoor Pool, Hot Tub, Sauna, Free Parking, our Madison Street Diner, Uncle Bos Bar, Maddies Lobby Bar, Fitness Center, Business Center, Convenience Mart and Extensive Meeting and Banquet Facilities for groups to 1500. Convention and conference centre. One drink coupon per guest for and standard rate of the day room. Your stay in one of our newly remodeled rooms will always be made comfortable with convenient amenities including special San Francisco Soap Company Amenities, Hair dryers, Coffee Makers, Full Cable TV with HBO and Showtime, Work Desks and chairs. We look forward to your next visit. Ramada Topeka Convention Center is a pet friendly hotel. Comanche was the only thing left alive when reinforcements reached Custer's Last Stand. He became the most famous horse in America, even after he died and was stuffed and put on display.